This is awarded to a current Michigan State University student of the Department of Fisheries and Wildlife who works toward the mission of SWMTU. This scholarship, and its intention, was founded by Sis Schrems in memory of her husband. Robin Ziegler is currently working in restoration ecology for USGS at the Columbia Environmental Research Center. She develops case studies for the Global Restoration Network regarding restoration work completed through the Department of the Interior’s Natural Resource Damage Assessment and Restoration Program (NRDAR). She also develops other web based materials for the NRDAR program to facilitate communication amongst restoration practitioners and the public. John F. Kocik has worked for NOAA- National Marine Fisheries Service since graduating from Michigan State University. He has been involved in conservation of anadromous salmonids for his entire career. From Maine, he leads the 12-person Atlantic Salmon Research and Conservation Task with staff in Orono, ME, Woods Hole, MA, and Narragansett, RI that assesses population status and effectiveness of recovery efforts of the last wild Atlantic salmon populations in the US with an emphasis on understanding estuary and marine survival and the impacts of dam on salmon ecosystems. Shari is an Associate Professor in the Department of Fisheries and Wildlife. I am currently employed by the Minnesota Department of Natural Resources in Little Falls as a Fisheries Specialist. While this area is dominated by lakes and warmwater streams (tributaries to the Mississippi River), we do have three coldwater streams managed for trout. Two of the streams are small and support natural brook trout populations. The third stream, Little Rock Creek, is larger and is dependent on stocking of brown trout to maintain a fishable population. Limited natural reproduction does occur. I am currently working with county SWCD offices, the Minnesota PCA, and the St. Cloud Chapter of T.U. to improve best management practices in the Little Rock Creek watershed to improve water quality in the stream. Plans to improve in-stream habitat to increase carrying capacity and natural reproduction are planned. The Schrem’s Coldwater Fishery scholarship helped me to fund my education and research at MSU. That education has enabled me to work with local groups and county governments to improve habitat and trout populations on our area coldwater streams. 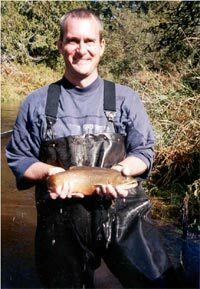 I have worked for Minnesota Department of Natural Resources for the past 17 years where I’m currently a Fisheries Research Supervisor overseeing the applications group. This group focuses on traditional fisheries management questions through experiments and through reviews of existing information. Prior to this, I worked as a research scientist II for six years and a research biologist for nine years. 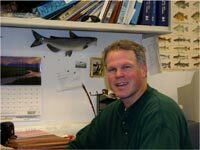 My professional work has covered a broad range of topics, including the influence of angling on bluegill life history strategies, the development and evaluation of a fish-based index of biotic integrity for Minnesota lakes, and the evaluation of walleye harvest policy in a shared fishery. In addition, I have worked with the MNDNR Fisheries Management Section on issues including trout regulations, yellow perch bag limits, walleye size regulations, and lake trout stock assessment. I’m currently a Fisheries Research Biologist for the Michigan DNR, working in Marquette, MI. I’m currently working on a variety of research projects including coaster brook trout research in the Lake Superior watershed. Research is directed at learning about the basic ecology of a remaining wild coaster population and the success of coaster reintroduction efforts. The scholarship helped me complete my grad research in Hunt Creek-effects of dewatering on the Hunt Creek brook trout population. Paola is an Associate Professor of Fisheries at Pennsylvania State University. Tammy graduated with a Ph.D. from Michigan State in 1998 and went on to Virginia Polytechnic Institute and State University as an assistant professor in fisheries. The lure of the Great Lakes called in 2002, whereby she returned to the state as the Lake Huron Basin Coordinator for the Michigan DNR Fisheries Division. In 2008, she assumed her current duty as Research Program Manager for Fisheries Division and serves on the Division’s Management Team. Jeff is Executive Assistant for the United States Capitol Police Board. Kristi is the Water Quality Programs Manager at West Michigan Environmental Action Council in Grand Rapids, where she is involved in a number of initiatives to engage the West Michigan community in water quality improvement activities. In this role, Kristi is a member of the steering committee for the Lower Grand River Organization of Watersheds where she works collaboratively with leaders from the various governments, business & educational institutions, community-based organizations, and individuals to coordinate efforts for improving water quality in the sub-basins of the Lower Grand River. 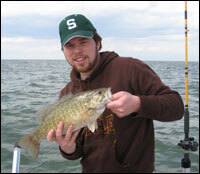 Kurt is the Lake Erie Basin Coordinator for the Fisheries Division, Michigan Department of Natural Resources. 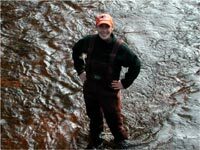 Jessica Mistak is a Senior Fisheries Biologist for the Michigan Department of Natural Resources, where she is responsible for initiatives concerning conservation, protection, and management of aquatic habitat. Jessica’s work involves providing technical and policy assistance to the Department on a variety of aquatic habitat related issues including mining, dam removal, fish passage, stream restoration, and participation in Michigan’s hydropower licensing proceedings. Jessica is a senior fellow in the Environmental Leadership Program and Past-President of the Michigan Chapter and the North Central Division of the American Fisheries Society. I am currently in my last semster of my Ph.D. program in the Entomology department at MSU. I have been studying the influence of marine-derived nutrients from spawning salmon on aquatic insect communities in Southeast Alaskan streams. This research will help us to better understand the role that these nutrient subsidies from salmon play in stream productivity in the Pacific Northwest a region where salmon population are in severe decline. The Schrem’s award was a great honor for me to recieve. The support of Sis Schrem’s for young scientists not only helped financially but it also provided an opportunity to see the social linkages of our work and how invested groups like trout unlimited are in the preservation of aquatic ecosystems. Brad Thompson is a Supervisory Fish Biologist for the US Fish and Wildlife Service in Washington, where I manage USFWS programs for anadromous salmonids, resident freshwater fish and habitat conservation, inter-jurisdictional fisheries management, and federal hatchery monitoring and evaluation for the western half of Washington. In my current position and previous position with the Washington Department of Fish and Wildlife, I have performed fish-habitat modeling studies needed to develop and implement habitat restoration projects for Chinook salmon, Chum salmon, and Steelhead populations currently listed as Threatened under the Endangered Species Act. More recently, I served as a US delegate in completion of a new 10-year Chinook salmon harvest sharing agreement between the US and Canada for Pacific Ocean salmon fisheries ranging from Southeast Alaska to Oregon. As a member of two NOAA science teams, I currently provide scientific oversight of hatchery, harvest, habitat, and hydropower programs identified in ESA recovery plans for Pacific Northwest anadromous salmonids. Bryan is continuing with his research on the Stronach Dam Removal Project while pursuing a Ph.D. at M.S.U. His research is directly applicable to improving trout habitat here in Michigan, but is also novel enough to improve the science of dam removal across the country. Having gotten to meet Sis, I am truly privileged and honored to have been given an award with her and Corny’s name on it. Their name is synonymous with a pure love for, and dedication to protecting our coldwater resources. Receiving the award was an honor and financial blessing, but getting to meet Sis was the real honor. She was a remarkable lady. I dedicated my thesis in her memory. Katrina Mueller received the Cornelius M. Schrems Scholarship as she was finishing up as a Masters student in the Department of Fisheries and Wildlife at MSU in 2004. Since then, she has continued her graduate studies at MSU under the direction of Dr. William Taylor and is currently working on a PhD project in cooperation with Dr. John Kocik (also a former Schrems scholar recipient) and NOAA-National Marine Fisheries Service. Since her arrival at MSU in 2002, her research and course work has focused primarily on connections between human social networks, salmonids and aquatic ecosystems. The idea that social networks influence how humans interact with their environment is relatively new to the field of fisheries management and an exciting area of growth. Her current research continues on this trajectory, focusing on human social networks in Maine and the structuring of opportunities stewardship and participation in Atlantic salmon recovery around network-based foci at the watershed-level. With the help of the Schrem’s Chapter I completed my Masters degree and research focused on the effects of dam removal on various stream attributes, including brown and rainbow trout populations. I am currently a Fisheries Biologist for the Wisconsin Department of Natural Resources in Madison. I am working on a range of projects, including analyzing data for the Treaty Fisheries program and developing policy to soundly manage fishing tournaments in Wisconsin. Although my work does not directly encompass coldwater resources, my passion for conserving and enjoying trout streams grows stronger every year as I explore the beautiful trout streams in the Driftless Area of Southwestern Wisconsin. 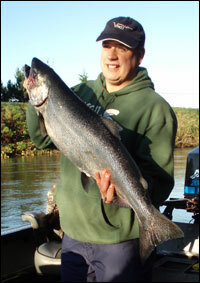 I received the Schrem’s Coldwater Fishery scholarship in 2006 as a second year Master’s student. At the time I was studying the views of stakeholders involved in the ongoing revisions of Michigan’s groundwater management, a process that proved to be critical for the state’s coldwater fisheries. The scholarship helped me finish my fieldwork, which involved traveling throughout the state to interview stakeholders. Kristine Boley-Morse graduated from the Fisheries and Wildlife Department at MSU with a Master of Science in the Spring of 2009. Her research at MSU included Stream Classification at stable USGSS gage stations throughout Michigan and the development of Regional Hydraulic Geometry Curves to aid in stream restoration in Michigan. She has worked at the Calhoun Conservation District for 10 years and is currently the Four Tribs Watershed Project Coordinator. Boley-Morse is also working on several other grants with the District including floodplain restorations on Rice Creek, replacing a road stream crossing on Rice Creek to restore stream connectivity, and the development of a watershed management plan for Crooked Creek, Pigeon Creek, the Dibble Drain, and an unnamed tributary in the Kalamazoo River Watershed. Kerry is originally from Chicago, Illinois. After receiving her bachelor’s degree from Beloit College, she moved to Alaska to work as an groundfish and marine mammal observer in the North Pacific, serving on the front lines of resource management by collecting high quality data for the National Marine Fisheries Service. It was an opportunity to be apart of perhaps the best managed fisheries in the world, facilitated contact with a variety of state, government and private agencies, and allowed for enhancement of data collection skills. In 1999, she joined the Peace Corps and served in Zambia, Africa as an Aquaculture Extension Agent in Isoka District, Kaumba Village for two years. After fulfilling her commitment to the Peace Corps she returned to Alaska to continue to pursue her interests in fish, fisheries and resource management. She secured a job as a marine biologist with NOAA Fisheries Alaska Groundfish Observer Program’s. This opportunity allowed her the opportunity to promote outreach with industry members, provide field support to observers in the various ports in Alaska, improve sampling methods on a variety of vessels, and participate in various research cruises. After serving four great years with the National Marine Fisheries service, she decided to enhance her career academically. She was drawn to Michigan State University because it presented multiple opportunities for research in addition to a great network for information and support in addition to the many accomplishments by and experience of the staff of the Fisheries and Wildlife department. She believes that people have the most profound effect on the environment and her studies will be guided toward examining this ideal as it relates to our valued freshwater fish and aquatic resources. Under Dr. Taylor’s tuteluge, she has proposed to examine influence of groundwater extraction on available brook trout thermal habitat in Twin Creek, a coldwater stream in Central Michigan. This study will hopefully emphasize the importance of the connection between groundwater and surface water systems as it relates to temperature and trout population health as well as examine the degree to which humans impact aquatic resources in coldwater streams in Michigan. 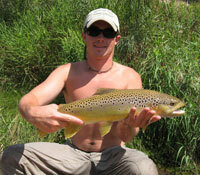 I am pursuing a Masters degree in Fisheries and Wildlife at Michigan State University. My research focuses on developing an approach that will identify stream habitat for species that may be range restricted or locally extinct, using a combination of landscape datasets and habitat data. In particular, I am determining whether habitat suitable for the Arctic Grayling exists within Michigan, where the species has been locally extinct since 1936. While the main goal of the project is to use new techniques and information to reexamine the possibility of bringing back a fish that remains iconic within Michigan, I also hope that the method I am developing can be used for other projects where species restoration is a concern. I hope to one day work on stream restoration, and continue to do so with the help and support of organizations like Trout Unlimited. It is an honor to be selected as the recipient of a scholarship that is given by such an active and well respected chapter of Trout Unlimited. The Schrems Scholarship will help make my summer field season possible and contribute to the completion of my research. To be associated with such an influential couple within stream conservation is an honor in and of itself. 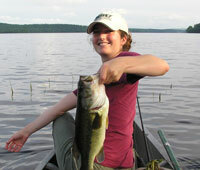 Corrine is currently pursuing a Masters degree at Michigan State University in the Fisheries and Wildlife Department. Her research will investigate the influence of temperature on mayfly growth and emergence on the Au Sable River near Grayling, Michigan. The results of this study will be applied to better understand the impact of climate change on aquatic invertebrates. It is an honor to be recognized by such an outstanding chapter and associated with such an inspirational and legendary couple. The Schrem’s scholarship was truly a fiscal blessing for my thesis research and graduate education. The generous support and encouragement provided by the West Michigan Chapter has provided me with renewed confidence and energy in my academic and professional (and angling!) pursuits. I look forward to a lifelong partnership founded upon a mutual appreciation and respect for the aquatic resources of the Great Lakes and united by a common aquatic stewardship and a vision for a sustainable future for many generations to come. I am currently pursuing a Masters degree from the Fisheries and Wildlife Department at Michigan State University. My research examines the effects of riparian timber harvest on aquatic habitat in southeast Alaska streams. Riparian vegetation has many important ecological benefits to stream habitats and indirectly, to wild salmonids, but until the early 1990’s there was little to no regulation of timber harvest in riparian zones of southeast Alaska. This led to lands being harvested to the banks of many coldwater streams. Managing stream systems requires knowledge of factors occurring in the riparian zone because the landscapes adjacent to streams are known to influence their physical, chemical, and biological characteristics. The results of this study will be provided to managers of the region to better inform their practices and give information on how riparian stand composition, large woody debris, and aquatic habitats are responding to historic human disturbances in the riparian zone of Alaska’s salmonid streams. I am extremely grateful to have been recognized by such a distinguished chapter of Trout Unlimited. The Schrems Scholarship was a crucial component of my field season, as it is extremely expensive to do research in southeast Alaska. The West Michigan Chapter is a big player in protecting coldwater resources, and the dedication illustrated is inspiring to a young professional looking to make a difference in fisheries conservation. I am excited to continue being valued member of Trout Unlimited and their grassroots effort to enhance coldwater fisheries for future generations to enjoy.